988 ⊙/ / German Reich - 1933 / 45, rich collection with a lot of better issues, partly also multiple formed, mixed quality, with much perfect material and better issues. With also Chicago travel 1933, two Wagner sets, trade set twice, Ostropa souvenir sheet 1935, Pair of olympia souvenir sheets 1936, further souvenir sheets, winter relief series, brown and blue ribbons, Nürnburg-race, Gdansk farewell series used and much further material, additional a few issues without gum, these without any valuation. Favorable valued collection with enormous catalogue value! 1004 ⊙/ German Reich - 1872 / 1945, interesting collection in the KABE illustrated album with main value on the third Reich. With also the charity souvenir sheet in original size nearly mint never hinged, professions set, Ostropa souvenir sheet 1935 unused still with the original invoice and certificate from 1967, Pair of olympia souvenir sheets with special cancel, all Hitler souvenir sheets, Gdansk farewell series and numerous further issues as for instance also the Wagner set 1933 used, Chicago travel used and so on. Favorable opportunity! 1011 / German Reich - interesting lot Weimar including good mint never hinged issues, with also upper margin copies, slightly mixed condition, with superb pieces, with also good values Presidents of the Reich and so on. Very favorable! 1028 ⊙/ 01. Sep German Reich - 1872 / 1945, interesting and rich collection, almost completely formed in the illustrated album with a lot of better issues. Also the breast shields abundant be present including Michel no. 1 / 9 used, 11 used, 12 / 13 handwritten cancelled, 16 / 27, Germania period including mark values, with also 5 Mk. Reichspost used, numerous inflation period issues, much Weimar including wood-pigeon 1924, airmail 1926, all help in need sets, as well an extensive part Third Reich with Wagner set, professions set, different souvenir sheets, brown and blue ribbons, winter relief series, Nürnburg-race, as well subsequent another extensive part official stamps. Favorable valued collection with very high catalogue value! 1057 / German Reich - 1933 / 45, nice and rich collection, nearly complete, predominantly mint never hinged formed in the Borek hingeless printed form ring binder. Many better issues including Frederick the Great, Hindenburg watermark waffle, 20 Pfg. Wagner in B-perforation expertized Schlegel BPP, 40 Pfg. Wagner, airmail 1934, trade set, uniform set, Ostropa souvenir sheet 1935, winter relief series, brown and blue ribbons, all Hitler souvenir sheets, Munich Riem overprint block, Nürnburg-race, Gdansk farewell series and further better issues, official stamps and so on. A rich collection with enormous catalogue value! 1084 ⊙/ / 909/10 German Reich - 1872 / 1945, extensive collection in the thick album, often twice collected. As well much used material from breast shields, then good part Germania with Mark value, Bavaria farewell issue, Infla many double available, Weimar Republic with help in need and so on. Main value by the issues Third Reich here with many complete sets in both conditions, winter relief sets, comradeship block series, issues brown and blue ribbon, souvenir sheets and so on. To Michel no. 909 / 10. Into the bargain official stamps as well issues Bohemia and Generalgouvernement. High catalog value! 1117 ⊙/ / German Reich - 1933 / 45, rich collection, mainly used collected in the lighthouse hingeless illustrated album with plenty of better issues, with also Wagner set, trade set, brown and blue ribbons, Pair of olympia souvenir sheets 1936, all Hitler souvenir sheets, Munich Riem overprint block, Gdansk farewell series and so on. Favorable valued! 1147 /⊙/ German Reich - 1872 / 1945, rich collection in the safe hingeless printed form ring binder with numerous good issues. As well breast shield stamps, Germania-time including mark values, with also 5 Mk. 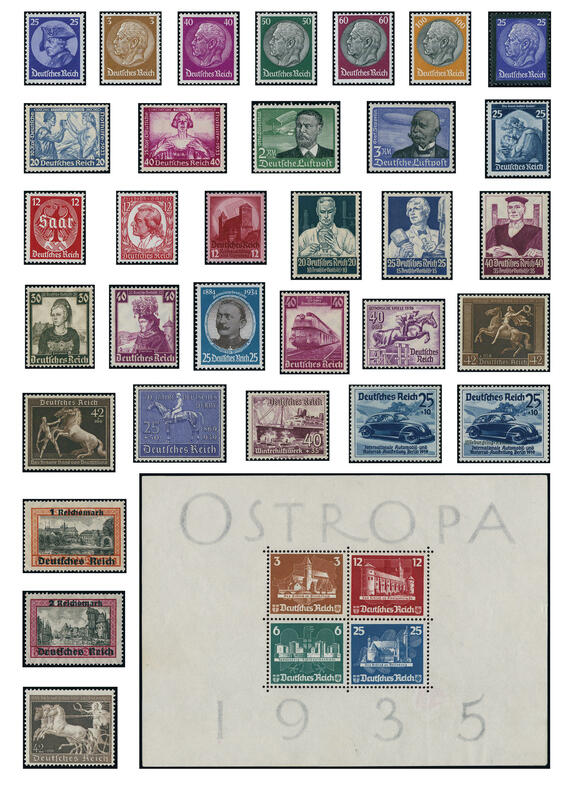 Reichspost used, expertized Jäschke BPP, an extensive part Weimar, with also International Postage Stamp Exhibition souvenir sheet 1930 (margin a little blotched), good mint never hinged help in need sets, much Third Reich including Chicago travel 1933, Wagner set, professions set, folk costumes set, Ostropa souvenir sheet 1935 (in the margin watermark break), Pair of olympia souvenir sheets, all fours Hitler souvenir sheets, Munich Riem overprint block, winter relief series, brown and blue ribbons, Nürnburg-race, Gdansk farewell series and further good issues. Favorable valued collection with substance! 1153 /⊙/ Third Reich - rich collection in a large stockbook accommodated with plenty of better issues, as well the stamps from the Ostropa souvenir sheet, many nice letter pieces with special cancellations, as well special- and commemorative issues, brown and blue ribbons, mint never hinged issues including complete sets right up to SA / SS unperforated and so on. Interesting object! 1170 Kart⊙n German Reich - interesting lot of single stamps of the inflation period in covers organized, very assorted, also much used material and so on. Into the bargain a few values Germania. Treasure trove! 1180 ⊙/ / German Reich - 1872 / 1945, collection in two Lindner T hingeless album as well still some on blank pages with numerous extra. The collection begins with some breast shield stamps, then issue penny / pennies, crown / eagle, Germania with Mark value, much Infla, Weimar Republic, Third Reich very well represented with many complete issues, souvenir sheets with olympic games souvenir sheet pair, winter relief series, issues brown and blue ribbon and so on. Into the bargain some documents. Very high catalog value! 1181 ⊙/ / German Reich - interesting lot in the stockbook, main value Third Reich with useful issues, complete sets, letter pieces with special cancel, many also multiple, official stamps, occupation issues and so on. 1240 ⊙ German Reich - 1933 / 45, extensive used collection in the Lindner T hingeless printed form ring binder with numerous complete sets, souvenir sheets and so on. Including Wagner set 1933, airmail 1934, 25-40 Pfg. Trades, Pair of olympia souvenir sheets, all Hitler souvenir sheets, Munich Riem overprint block with first day special cancel, winter relief series, brown and blue ribbons and so on. Favorable! 1261 ⊙ German Reich - 1933 / 45, collection in the old album with mounts with many complete sets, winter relief sets, issues brown and blue ribbon, Gdansk farewell series, comradeship souvenir sheet, Nürnburg-race, olympic games souvenir sheet pair with special cancellation, all Hitler souvenir sheets, Munich Riem overprint block 1937 with first day special cancel and so on. High catalog value! 1389 ⊙/ 24, Mi. €, 9/14 German Reich - 1872 / 1923, rich collection, nearly complete in the Lindner hingeless printed form ring binder with plenty of better issues. Thereby also extensive part breast shield stamps including better values, including 2 Kr. Large shield used (Michel no. 24, Michel 3200,- €), penny / pennies and crown / eagle, Germania-time including mark values abundant, with also 5 Mk. Reichspost used, as well an extensive part inflation issues. Subsequent also the official stamps, also the issue for Baden (Michel no. 9 / 14). Besides also airmail stamps with E. EL. P. 1912, 1 Mk. Yellow dog and so on. A magnificent object with very high catalogue value! 1390 ⊙/∆/ German Reich - 1923 / 32, complete collection Weimar Republic with all issued stamps in the Lindner hingeless printed form ring binder. With also all help in need sets, I. A. A. 1927, important German, Presidents of the Reich, International Postage Stamp Exhibition souvenir sheet 1930, 1-4 RM. Zeppelin, South America flight 1930 used, Polar travel 1931 used, wood-pigeon 1924, airmail 1926, as well official stamps. Favorable! 1391 / German Reich - 1933 / 45, complete collection of all issued stamps in the Lindner hingeless printed form ring binder. As well all better issues including Chicago travel 1933, Hindenburg set watermarked waffle, Wagner set, charity souvenir sheet Nothilfe wonderful fresh colors in full original size, airmail 1934, trade set, Ostropa souvenir sheet 1935, all further souvenir sheets, winter relief series, brown and blue ribbons, as well official stamps. A magnificent object! 1402 ⊙/ / 94/97AII, 118a, 330B German Reich - 1872 / 1923, rich collection in the KABE-Album formed with lots of material, mixed quality, with numerous superb and extremely fine copies. As well the breast shield stamps complete used, herewith the 18 Kr. Twice signed Sommer BPP, penny / pennies and crown / eagle very abundant including numerous colors, shades, expertized issues, Germania period including mark values extensively present, with also 5 Mk. Reichspost, wartime and peace prints including Michel no. 94 / 97 AII used expertized Jäschke BPP, 1 Mk. Yellow dog on piece, 10 Pfg. And 20 Pfg. Rhine-Main airmail on accordingly airmail postcard, as well the 30 Pfg. Used, besides an extensive part inflation issues, with also Michel no. 118 an as used corner of the sheet expertized Bechtold BPP, 134 / 38 II used expertized Infla / Berlin, as well numerous further better issues as for instance Michel no. 330 B used expertized Peschl, Infla / Berlin and so on. Enormous catalog value! 1403 ⊙ German Reich - 1923 / 32, extensive used collection, nearly complete on KABE hingeless preprinted pages with numerous good issues including wood-pigeon 1924, airmail 1926, I. A. A. 1927, all help in need sets from 1924 / 32, 1-4 RM. Zeppelin, South America flight 1930, Polar Flight series, International Postage Stamp Exhibition center piece on registered cover and official stamps. Favorable! 1404 ⊙ German Reich - 1933 / 45, extensive used collection, in the number of a major listing except for souvenir sheet 2 complete in the KABE hingeless illustrated album. With also Chicago travel 1933, Wagner set in A and B-perforation complete, professions set, Ostropa souvenir sheet on appropriate illustrated cover the exhibition by registered post with special cancel (traces of usage), all further souvenir sheets, Nürnburg-race, Gdansk farewell series, brown and blue ribbons, as well additional as well numerous se-tenants. Favorable valued!